No basket is fresher than an Atlanta Bread Gift Basket baked the day you give it. Fresh baked Holiday Gifts are an Atlanta Bread Huntsville specialty – fresh baked gift baskets, pumpkin bread, pastry trays and boxed goodies. 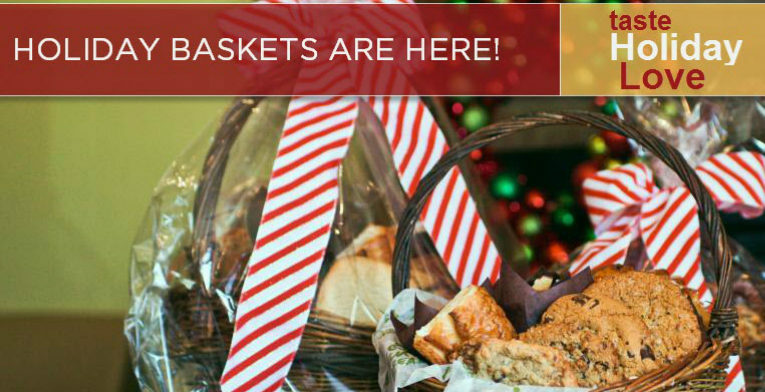 When you want a special and unique gift for another business, a doctor’s office, or a family you care for, a fresh baked gift basket from AtlantaBread Huntsville is ideal. There is nothing else like this gift. Every item is baked and prepared fresh for you on the day you give the basket. This is one gift basket that will be empty by the end of the day. Nothing but fresh, tasty baked goods. 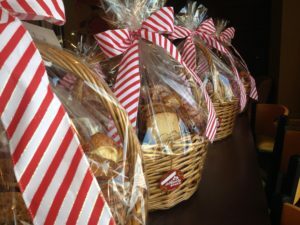 A gift basket made of fresh baked croissants, cookies, and pastries is great way to say thank you to business offices you work with, clients, or neighbors. How about a gift basket for the doctor’s office. They take care of you all year. Why not take a basket of fresh baked goodies to them for Christmas. Cranberry-orange, banana nut, pumpkin, and mocha bread. Great small gifts for the holidays. Holiday breads baked fresh throughout the day during the holidays. We also offer a variety of bread loaves that make wonderful gifts year round, particularly around the holidays. Our pumpkin and cranberry orange walnut breads are the most popular. Banana walnut, mocha chocolate chip, and blueberry are available as well. We bake these several times per day during peak holiday season. During other times of the year we gladly bake these breads to order. Call ahead (256.922.2253) and we can bake your loaves within about four hours. An Atlanta Bread gift card is a great gift for someone to discover Atlanta Bread or for someone who comes in often. You can purchase gift cards at our bakery cafe in five dollar increments. You can also order egift cards online. Download our Gift Price Sheetfor more information.